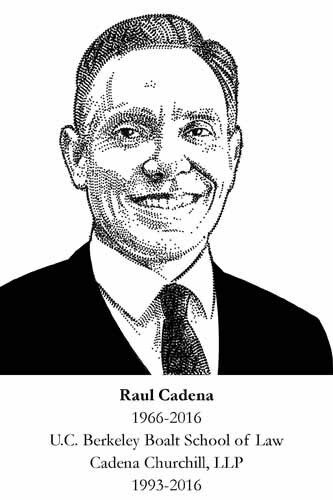 "A native of El Paso, Texas, Raul Cadena earned a bachelor‚Äôs degree in Sociology from Harvard University in 1989. He also studied the economy, society and politics of Spain at the Universidad Complutense and earned his law degree from U.C. Berkeley Boalt School of Law in 1993. He was admitted to the California and Texas Bar Associations. Mr. Cadena began practicing law with Brown Mc Carroll, LLP in Austin, Texas. He moved to San Diego in 1996 and practiced with Littler Mendelson P.C., Sullivan Hill, and Contreras & Gomez. In 2003 Mr. Cadena and his wife, Kristen Churchill, formed a partnership, Cadena Churchill, LLP, where he practiced until his passing in June of 2016. His practice emphasized the representation of employees in Employment Class Actions. Mr. Cadena was a trained and sought after mediator for over a decade, most recently as a member of the West Coast Resolution Group, a division of the National Conflict Resolution Center. He was also a past adjunct faculty member at Southwestern Community College. Mr. Cadena was an active member of various professional organizations, serving on various leadership boards. He served on Board of Directors of Consumer Attorneys of San Diego (CASD), and was president of that organization in 2015. He also held the position of Employment Law column editor for the Trial Bar News, a CASD publication. Mr. Cadena served on the Board of Directors for California Rural Legal Assistance (CRLA) from 2013 to 2016. He served as an At Large Member of the Board of Governors for the Consumer Attorneys of California (CAOC) from 2013 to 2016. He is a past member of the Board of Directors for The National Conflict Resolution Center (NCRC). Mr. Cadena was very active in the community of Pacific Beach. He was President of the PTO at his children‚Äôs elementary school, Crown Point Jr. Music Academy from 2010 to 2012. Mr. Cadena was an active member of St. Andrew‚Äôs-by-the-Sea Episcopal Church, a past member of its governing board, and past Chair of the St. Andrew‚Äôs Preschool Advisory Committee. He was a past member of Board of Directors for the San Diego Council on Literacy. As a member of the Harvard Club of San Diego, Mr. Cadena annually interviewed local applicants to Harvard College. Mr. Cadena was an avid runner who completed several marathons over the years. He enjoyed snow skiing, bike riding, hiking, swimming, boogie boarding, and kayaking with his family and loved running and taking walks with his wife, Kristen. Mr. Cadena loved traveling with his family, and recently visited London, Paris, and Madrid."